Science fiction and fantasy book fans have an exciting month to look forward to in July 2018. There are books from legends of the science fiction genre such as Poul Anderson and also from excellent fantasy writers such as Naomi Novik. If you’re into reading, now’s a great time to pick up a newly released science fiction or fantasy novel. Poul Anderson is among our favourite hard science fiction authors for his works such as Tau Zero. If you’ve never read any book by Anderson, we highly recommend Tau Zero but only if you are interested in hard SF. The characters aren’t great in that book but the scope of the plot is vast that definitely makes it worth a read. The Psychotechnic League is a collection of short stories from the future history genre. This means you can expect to hear about the aftermath of World War III and what humanity’s future looks like via short stories set in the far future. This volume features new stories by Poul Anderson and one of the key plot points is a science called Psychodynamics, the ability to influence the government and popular opinion. This kicks in after World War III and brings a reign of peace on Earth. However, no utopia lasts forever and this one shares the same fate. This is the last volume in the Psychotechnic League collection of short stories. Naomi Novik has such a big following that she doesn’t need much in the way of an introduction. The author writes fantasy and her Temeraire series is among her best-known works. The series has nine books and is one you must read if you’re into that genre. Think Napoleonic wars with dragons! She’s also written standalone novels such as Uprooted, which are worth reading too. On to her latest novel — Spinning Silver — where Miryem, the protagonist, belongs to a family of moneylenders but her father is not very good at the family trade. While her father lends easily and is reluctant to collect the loan, Miryem is the exact opposite. With the family on the edge of poverty, Miryem develops a reputation of being able to change silver to gold. However, that captures the attention of cold creatures that haunt the wood. Their king wants to exploit Miryem’s skill for reasons unfathomable to the protagonist. Neil Clarke is best known as the editor of Clarkesworld magazine, which is home to all things science fiction. His work for the magazine has earned him multiple Hugo Awards, which is among the top awards in science fiction. 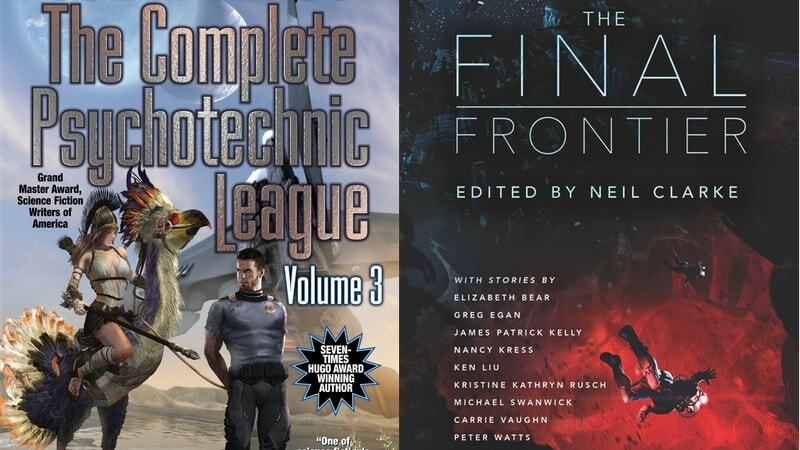 The Final Frontier is a collection of short stories edited by Clarke and features stories from across the literary spectrum with one common theme — humanity’s urge to explore the edge of unknown. You can expect SF works that take you to the edge of the universe and different takes on exploring new worlds. Carrie Vaughn is a fantasy and science fiction writer known for her Kitty Norville urban fantasy series. Another one of her interesting works is the Coast Road series. We’ve so far seen one novel (Bannerless) and a prequel in this series but it does have a lot of potential. The Wild Dead is the second book in the series. It is a post-apocalyptic novel set a century of environmental and economic collapse. The people of the Coast Road have rebuilt their life, and pledged not to make the mistakes of their ancestors. They strictly ration all resources and the right to have children. The novel has two protagonists — Enid and Teeg — who are investigators in the Coast Road. The pair are called in to settle a straightforward dispute when they discover a body nearby. To complicate matters, the body is of a person who lives outside the Coast Road. The plot revolves around this murder and the concept of morality in a dystopian future with isolated communities. Kameron Hurley is among the newer writers in the world of science fiction and we’ve previously featured her book The Stars Are Legion in this column. That one dealt with the travails of a group of people travelling in deep space and how they deal with their world being turned upside down. Apocalypse Nyx’s title alone tells us a lot about the book. The protagonist is called Nyx and is an ex-government assassin turned bounty-hunter. She lives on an apocalyptic world full of giant bugs, magicians, contaminated deserts, and where a centuries long war persists. This book is the story of Nyx and her crew of ragtag band of misfits, where every step takes them ever closer to a hellish future. Which book(s) are you looking forward to in July 2018? Let us know via the comments.